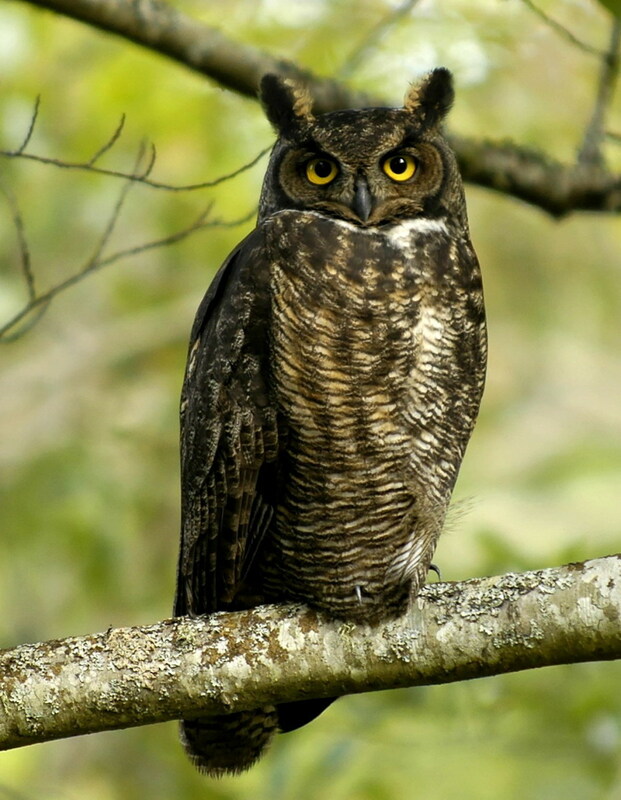 Many birds have become extinct over the past few centuries, mainly due to over-exploitation, destruction of habitat, the introduction of other animals that out-compete or prey on them, or a combination of all three. The most famous of these is the Dodo, (Latin name Raphus cucullatus), so famous that it became proverbial - "Dead as a Dodo". This large flightless bird of the pigeon family inhabited the island of Mauritius, an island in the Indian Ocean, about two thousand miles from the coast of Africa. The painting shown above may be one of the last illustrations made of a live Dodo (1638). It is housed at Boijmans Museum in Rotterdam. The painter, Cornelius Saftleven, was one of a family of painters. He excelled at painting animals, and his works show the influence of Roelant Savery, another artist who painted the Dodo. Savery was very important in establishing our image of the bird to this day, as explained later in this article. 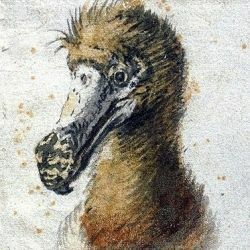 This is a general reader introduction to the very little that is known for sure about the Dodo, from a writer who specialises in books about extinct birds. Thanks to DNA investigation in recent years, we now know that, unlikely as it seems, the Dodo was a kind of pigeon. These ex-pigeons lived an idyllic existence, isolated on the island of Mauritius. So idyllic in fact that they gave up flight in return for putting on weight and dining on the plentiful foodstuffs. In the painting below, painted by Roelant Savery, one can be seen on the right, bending to drink. 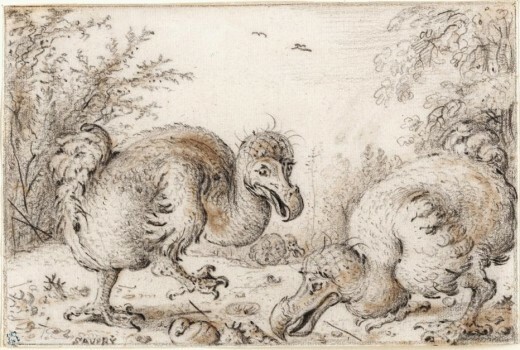 Savery, who is sometimes known as Roelandt Savery, took a few artistic liberties, such as adding ruins in the background, and having the Dodo in coexistence with ostriches and other birds. Savery was a Dutch painter who specialised in landscapes, but often featuring carefully painted wildlife. The Dodo seems to have fascinated him, as it was a subject he returned to again and again. In fact, he is known for being the most prolific painter of this bird, and his images of it were enormously influential on other painters and also on later naturalists. * Scholars think this was a misnamer for pinion, referring to the Dodo's small wings. The Dutch sailors were looking for fresh meat to enliven their diet of weevil infested ship's biscuit, and the Dodos were so tame they stood bemused as the sailors pounced on them, and even came running to help when one of them was grabbed. More ships came and the European sailors continued to kill the Dodos to supplement their diet. Yet the real threat was from the other animals that the sailors introduced. Rats competed with the birds for food, but the most serious menace was probably the pigs which overran the island, since pigs are a serious predator of ground nesting birds and their chicks. This is a scholarly study about the Dodo and another extinct bird related to it, called the Solitaire. Beset on all sides, the Dodos didn't stand a chance. 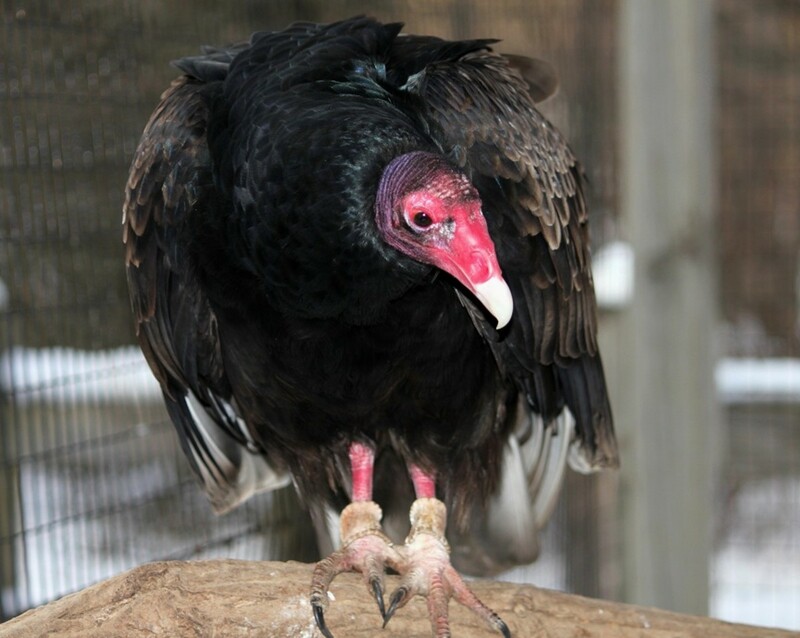 After a mere sixty years, their numbers crashed and they finally became extinct in 1662. Now not even stuffed ones remain in museums - just a few fragmentary remains like those shown below, some fossils recovered in more recent years, and a few artists' reconstructions, like the ones depicted above. During the period since their first discovery, only a handful of Dodos had survived the perilous sea voyage to Europe or been sketched or painted, not always with accuracy. 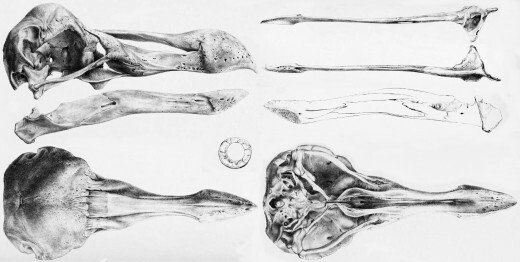 Some drawings or paintings show the birds as grossly fat and oddly proportioned, but this could have been the result when badly preserved dead ones were painted. Ustad Mansur's painting, made around 1625 and shown here, may be one of the most accurate depictions of a live Dodo. 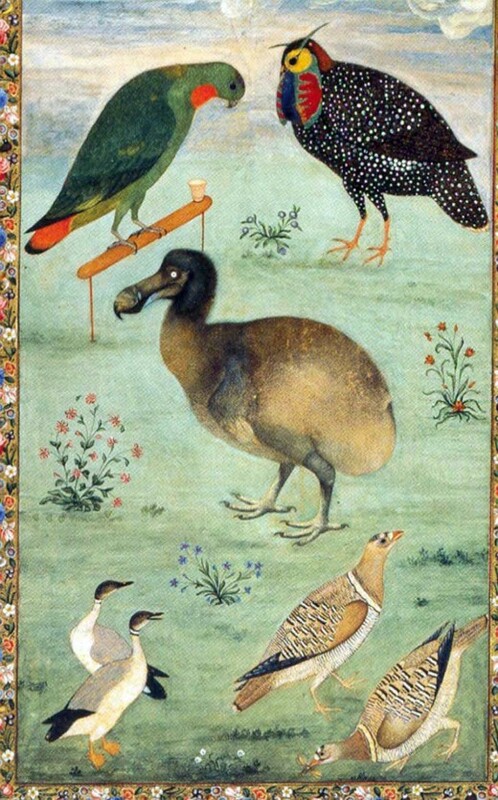 Two live birds were brought to India in the 1600s according to the explorer Peter Mundy who saw them in the menagerie of the Mogul emperor Jahangir in Sura, and this painting probably shows one of those. Historians believe that the Dodo's appearance must be pretty accurate as all the other birds in the picture are painted correctly. 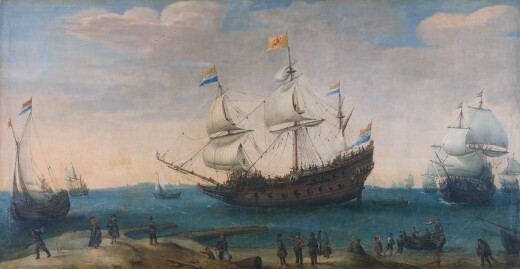 Contrast this to the portlier version in the painting below, by Roelant Savery in 1626. As usual, Savery threw in a few parrots for a bit of colour, and this time the Dodo has yellow plumage. 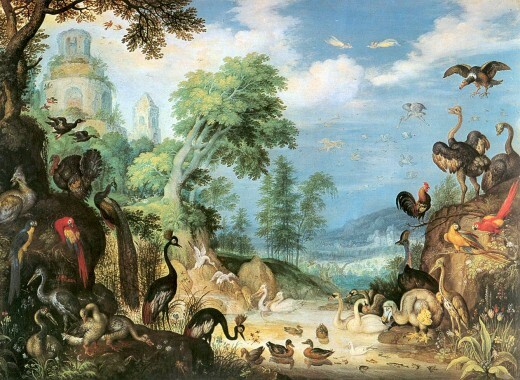 (He also painted it white in his fanciful 'Landscape with Orpheus and the animals', leading to a sub-genre of paintings with white Dodos, and a lot of confusion among 19th century naturalists, although there is no evidence for Dodos being white. In fact, it led to a persistent idea that the bird was also found on the island of Reunion, but this appears to have been a confusion stemming from old stories of a white bird that flew with difficulty, now thought to have been a species of white ibis, and also sadly extinct.) The idea of the Dodo is becoming fanciful as the real bird recedes into lost time; you can hardly imagine how such an odd looking creature could have thrived, even on an island without natural enemies. 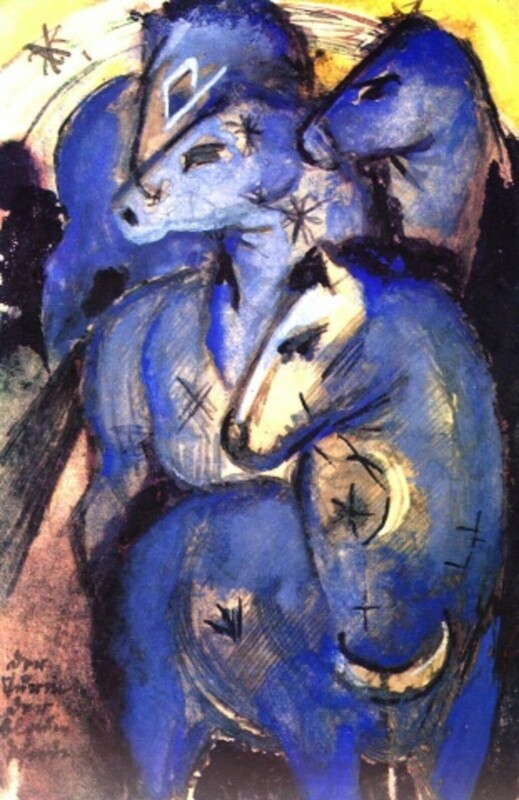 Roelant's image was subsequently copied by many artists over the centuries, becoming more and more bloated and odd looking. Here's a painting by his nephew Hans, also known as Jan Savery. 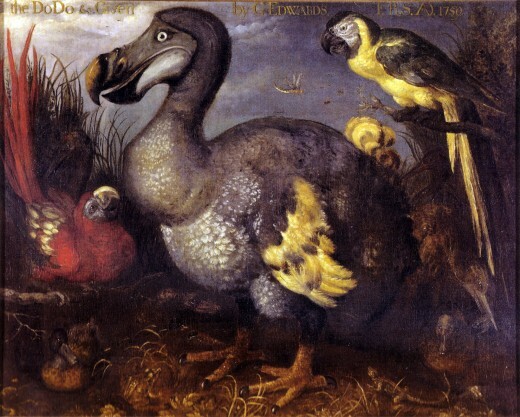 In this later picture, the Dodo looks really down in the beak, which it was entitled to be in the circumstances. 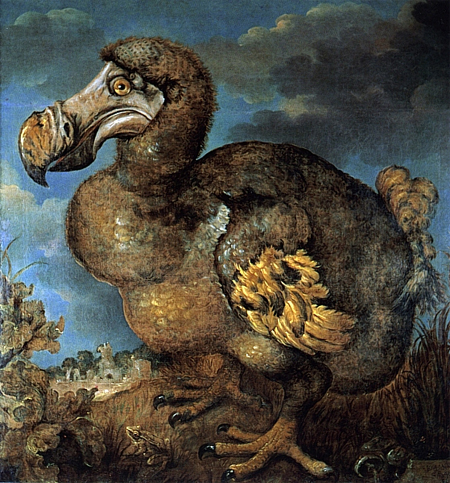 This painting played an important role in the next stage of the Dodo's life, or rather afterlife. Despite its sad demise in reality, the Dodo is so memorable with its strange and comical appearance that it has found a phantom existence in fiction. 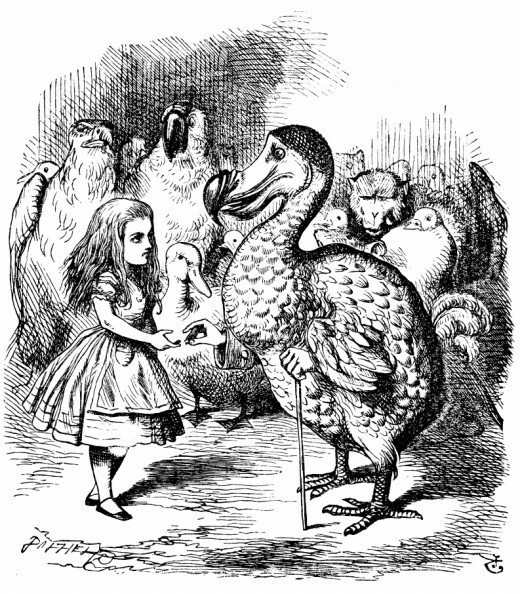 It was first popularised in Lewis Carroll's 'Alice's Adventures in Wonderland', and the story goes that Lewis included the Dodo in his story after seeing Jan Savery's painting of it, at Oxford. 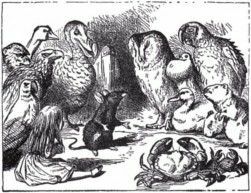 No wonder such an odd looking bird has been immortalised in Tenniel's illustrations, given that they were based on the bloated, unhappy looking creature in Savery's depiction. If You Could be a Character, Who Would You Be? If you could be a fictional character, who would you like to be? The first in the series, and the only one I've read so far. Someone is kidnapping characters from classic novels, then they kidnap Jane Eyre. Thursday Next, literary detective, must save both Jane herself and Bronte's much-loved story. 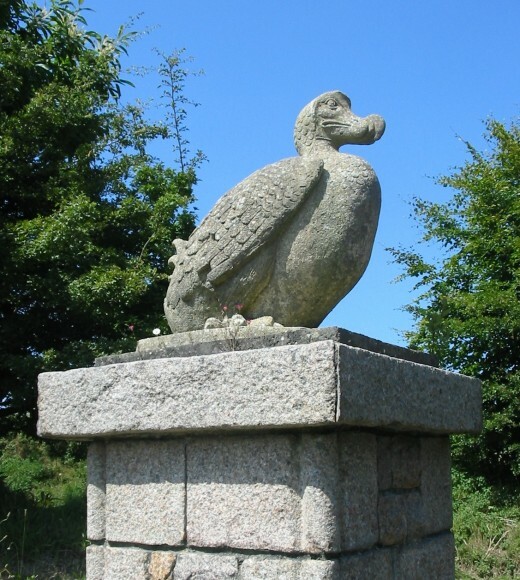 Recently, the Thursday Next comic fantasy novels of British writer, Jasper Fforde, feature a pet Dodo called Pickwick, recreated from Dodo DNA. As Thursday's world is an alternative history to ours, genetic engineering is far more advanced. It probably isn't feasible in our universe, but it's a nice idea. The books are imaginative and a fun read: for example, England is a republic and literature is so important that Thursday is a literary detective. The barrier between fiction and reality breaks down in these books, allowing characters to move from the printed page into the real world. The one shown here is a paperback edition, but you can also get them for the Kindle or in hardback. To date, the series has expanded to seven books. The image of the Dodo lingers on, and has become everything from a character on the Mauritius coat of arms to a symbol used to promote preservation of endangered species. Even Doctor Who had a companion called Dodo in the 1960s. And it continues to inspire artists as shown by this statue at the Jersey Zoo. Probably more has been written about the Dodo than any other bird, and with slimmer evidence. Actual remains of birds are very scanty - just a few bones. More have since been excavated as fossilised remains. Here are some useful links if you want to dig deeper into the sad story of the Dodo. Alternatively, you can read more about the Dodo in the books shown in this article, or even cuddle up with a soft toy version. What Are Your Thoughts About the Dodo or Extinct Birds in General? Great explainer. Of course I had heard of the dodo, but only in the "dead as..." expression. I enjoyed learning about this unique bird. Thanks for reading @Thomo85. Yes, a real shame. And so many current birds under threat too, which I am very concerned about. Real pity that lessons don't appear to be learned. What a great read, I have never really investigated the dodo. I have spent a lot of time researching the extinct megafauna of Australia and the rest of the world but I must have skipped the Dodo. 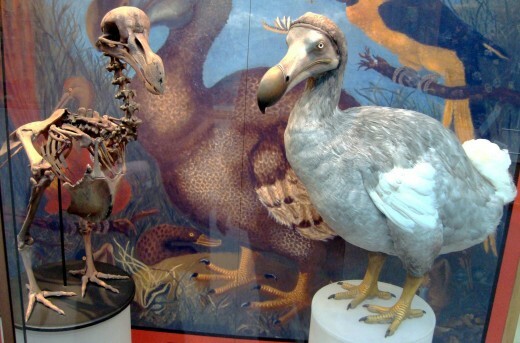 I hate that only a few hundred years ago there were Dodo's and because of humans no one will ever see a Dodo again. @Lionrhod, yes, it's sad they're no longer around. @Charmcrazey, @FanfrelucheHubs, glad you both enjoyed the article. I didn't know about those films; interesting. I'll have to look into that, I feel an article update coming on! Tony, yes, they had no natural predators so they didn't need to fly until people showed up with their pigs and rats. Poor old Dodo :( Flight is often a bird's best means of escape from a predator, so a flightless bird is doomed, unless it's predators are few. Love your hub, it's interesting and well written! Dodo Birds played a comical role in the animated film Ice Age. Although the script seemed to infer they became extinct during that era. It was a cartoon and obviously not supposed to be historically correct. Now I know better. Love to learn about animals and birds of all kinds so this was a great read! Thanks for a fun and informative lens! I grew up near the NY Museum of Natural History and was always fascinated by extinct and rare creatures. Their okapi display was one of my favorites. Dodo's always fascinated me. So sad to see so many animals go extinct in only the last couple hundred years. I am sad for our loss of the Dodo, and for our loss of all extinct species. Well you taught me something. Last time I heard of a Dodo bird was on the Flinstones Cartoon. Interesting reading. You mention that the Dodo lived in Mauritius, but it also existed on the little island where I live, La Runion. Here there are many modern products, such as a local beer and T-shirt brands that use the Dodo name to remember the extinct bird. I really enjoyed reading about it's history and you've covered the topic very well. @Rosetta Slone: Thanks for telling me about that - it doesn't seem to be mentioned in any of the histories. Will need to follow that up to try to discover whether it became extinct on your island from the same causes. I'd always known about the dodo birds being extinct, but never knew their history. It may be a sad story, but the more people that know about it, the less likely it is to happen again. Some of us do learn from the past. @flycatcherrr: Yes I agree. They didn't deserve it. Creatures who evolve on isolated islands are especially vulnerable to human intrusion and competing animals - goats, rats, you name it - introduced by people either deliberately or incidentally. There's a cautionary tale in the extinction of the Dodo, don't you think? Any time a species becomes extinct, it is a heartbreak (or a monument to mankind's gross self-absorption, take a toss), but for some reason that trusting stupid Dodo face just makes it all somehow worse in that case. What an informative article on the Dodo bird. I have often heard it mentioned, and knew it was extinct because of it's vulnerability to man, but you really summed it all up for me. 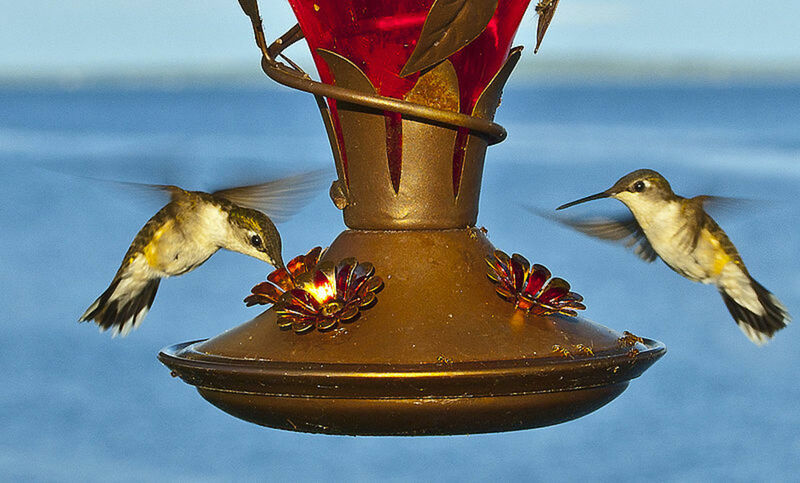 Excellent article on birds and extintion.